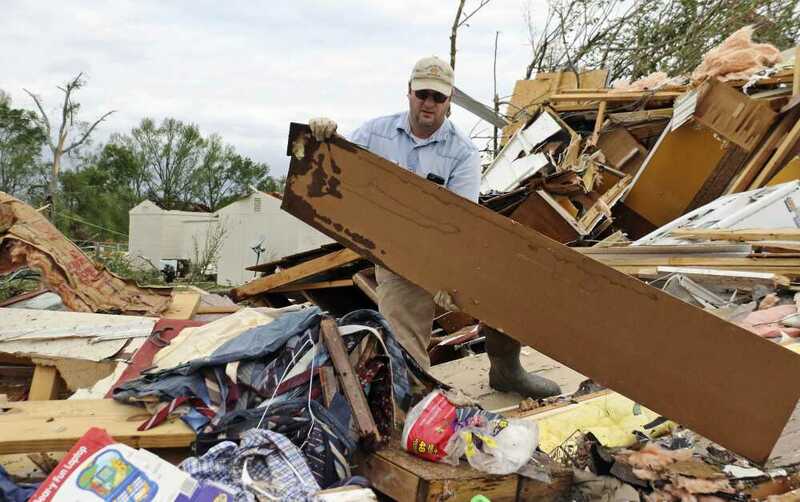 Roman Brown moves part of a wall out of his way as he looks for a friend's medicine in their destroyed home Sunday along Seely Drive outside of Hamilton, Mississippi, after a storm moved through the area. Nearly 90,000 customers were without electricity in Texas, Mississippi, Louisiana, Arkansas and Georgia as of midday Sunday, according to poweroutage.us as the severe weather left a trail of destruction. At least one person was killed and about two dozen were injured after a suspected tornado struck the Caddo Mounds State Historic Site in East Texas during a Native American cultural event in Alto, about 130 miles southeast of Dallas. Cherokee County Judge Chris Davis said the fatality reported was of a woman who died of her critical injuries. The weather service said preliminary information showed an EF3 tornado touched down with winds of 140 mph. It destroyed 55 homes, a church, four businesses, a duplex, and part of the local housing authority building, authorities said. Two people were hospitalized for injuries not thought to be life-threatening, while others were treated at the scene, Yezak said. Some people had to be extricated from damaged dwellings. Roy Ratliff, 95, died after a tree crashed onto his trailer in northeastern Mississippi, Monroe County Road Manager Sonny Clay said at a news conference, adding a tornado had struck. Nineteen residents were taken to hospitals, including two in critical condition. A tornado was reported in the area 140 miles southeast of Memphis, Tennessee, at the time. The forecast of severe weather forced officials at the Masters in Augusta, Georgia, to start the final round of the tournament early Sunday in order to finish in midafternoon before it began raining.